Not every weapon system, soldier or piece of military real estate left from the cold war is dysfunctional or useless today: but bad planning, neglect, ignorance and lack of resources have left Europe burdened with large relict capacities suited neither to the spirit nor the practical needs of the new environment. For the nations which hold them, such leftovers may represent an embarrassment, an economic burden or at worst a threat to health and safety and to the local environment. If items from them are transferred (legally or illegally) to other regions, however, they could still play a role in sparking and aggravating new conflict. In criminal or terrorist or ‘rogue state’ hands they could rebound very directly against Europe’s own security. The challenge is therefore one which an enlarged Europe and its neighbours cannot afford to ignore, and the current debate over Europe’s security interaction with the rest of the world lends it an extra urgency. 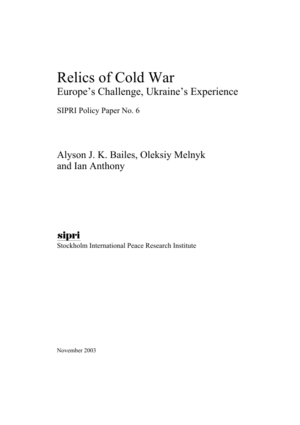 This SIPRI Policy Paper aims to illuminate the problem, and to provide a basis for debate on future policy approaches, through a general review of the challenges followed by a detailed case study of the scale, impact and policy handling of the cold war’s defence-related legacy in Ukraine.